We’re kicking off a briefer story with this one, folks, in which an unprecedented tactical use is discovered for the clingy but tatter-prone hypermembrane of Emp’s supersuit. You might wonder why you so commonly see comic-book characters wielding a pistol in one hand—or one in each hand, even more commonly—even though two-handed grips like the one Emp uses here are more tactically sound and lend themselves to greater accuracy. (Uh oh, hope I’m not triggering—ha ha!—any firearm enthusiasts out there into another round of the endless debate over “point shooting” versus the use of sights.) The pretty simple explanation? 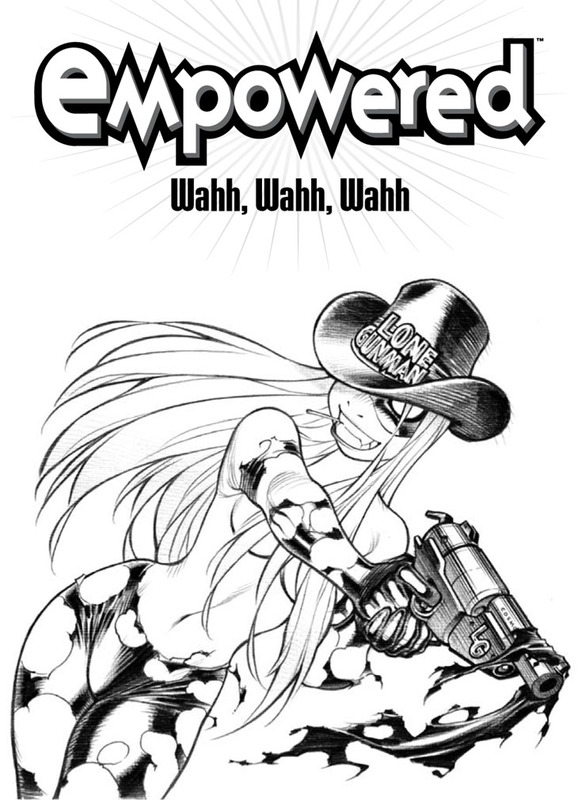 Two-handed pistol stances like this are much tougher to draw than single-handed ones, as the positioning of the support arm and hand can prove maddeningly challenging; in fact, I’m fairly certain I had to use photoreference to pull off this drawing of Emp. Same deal with how artists love to draw single-handed use of Japanese swords, even though the lengthy grip of a katana was obviously designed for a two-handed grip. Yes, I know, single-handed grips are indeed a valid part of kenjutsu, but they’re very much a secondary aspect of a martial art that leans heavily on two-handed forms.